An exotic call or put option that periodically settles and resets its strike price at the level of the underlying. Also known as a ratchet option. At reset dates, the option locks in the difference between the old and the new strike and pays that out as a profit. If the stock has moved the wrong way during the preceding time period there will be no profit, and the investor will lose the premium corresponding to that period. Essentially cliquet options are constructed from a series of forward start options. The aggregate premium and the number of reset dates are determined in advance. Payoff at maturity can be based on either a relative or an absolute performance. 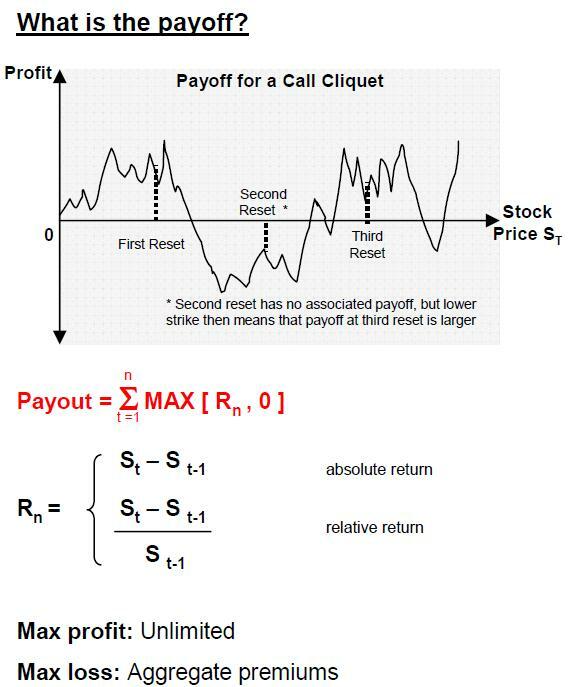 The profit can be accumulated until final maturity or be paid out at each reset date. Used where volatility is expected to rise, as investors can lock in returns periodically rather than risk losing gains that have accumulated. Suitable for clients who see up/downside for a stock but are unsure as to the exact timings/sustainability of share price moves (and want to have a better chance of locking in profits once this occurs). Can be implemented into a structured product for retail clients. Traditionally buyers were retail and private investors when embedded in deposits and bonds as they provide a low risk exposure to quity and debt markets. Now, also sophisticated investors use cliquets in order to take advantage of future assumptions about voltility. Less risky than traditional options as profits are locked in as the underlying asset performs. Entire cost of a cliquet is known on the day of trading – if an investor were to buy two one year vanilla calls, the price of the second call will not be known for a year. Intermediate management is not required. opening in I.E., it’s got some overlapping issues. I merely wanted to give you a quick heads up!